I’ve been putting this off for way too long, and so here is the start of my new environment project. What I intend to achieve with this project is trying out and streamlining a modular approach to creating an environment, starting with generic building blocks like lego to work out the structure of the building then detailing accordingly. 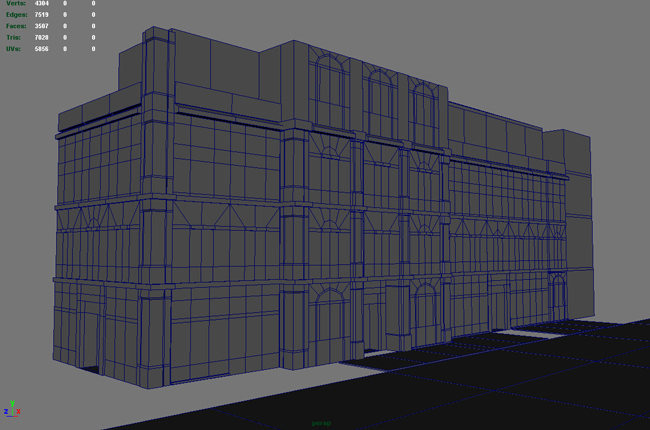 The blocks are all instanced so editing them and adjusting UVs are fuss free. I’ve chosen Piazza Navona in Rome as my reference as the different buildings around the square are suited to it. Not gunning for an exact copy, trying to study the structure of the buildings, how the parts are arranged and such. Day one is over and the main building is mostly completed except for the roof. I’d say a maximum of 1 and half days to finish this off and move on to the next one. So far things have gone pretty smoothly. It feels really different from just a few months ago working on my first environment. Well.. let’s see how this goes shall we? This entry was posted on Tuesday, October 7th, 2008 at 5:48 am and is filed under Environment. You can follow any responses to this entry through the RSS 2.0 feed. Both comments and pings are currently closed.